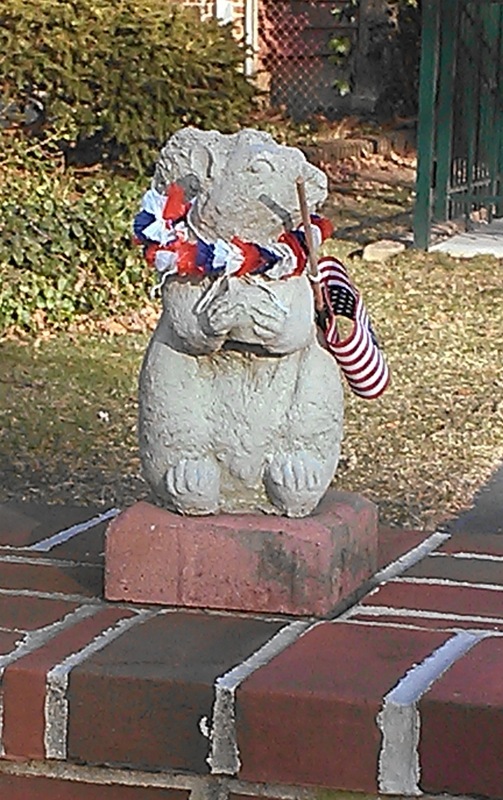 First off, the squirrels and I would like to wish you a happy, though belated, President's Day. a tricornered hat and a miniature powdered wig. Profound apologies for failing to mark the occasion on time. * I snapped the picture while on a walk yesterday with all intentions of posting it, but was hit by an epic case of the sleepies last night and decided to just go to bed instead. Actually, the sleepies are pretty rough tonight, too. But I do believe in timeliness and also I'm trying not to procrastinate on stuff (even meaningless hobbies) I'm going to soldier though. Yesterday was lovely -- cool, but with blue skies and sunshine. And, more importantly, there were plenty of things to observe around the neighborhood. And flowers in bloom. That's right! Flowers! 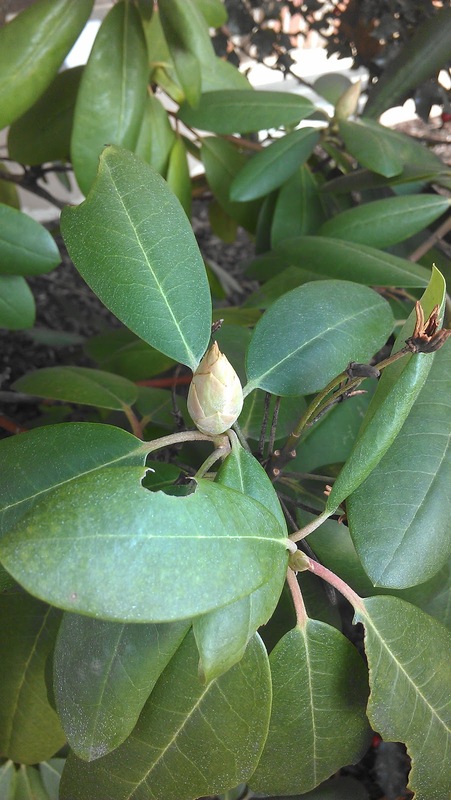 In bloom! There were pretty little snowdrop flowers at a house on Russell and crocuses at the dog trainer's and in my front yard (we don't get out in the front yard much this time of year). I ran over the mums a couple of weeks ago. These might be my only hope for flowers this year. Crocuses are supposed to bloom in late winter/early spring. 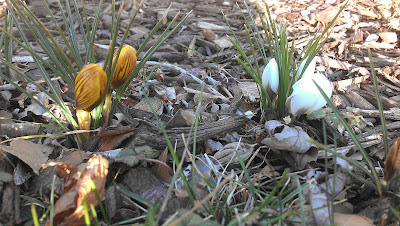 As of tomorrow, we're still a month out from spring so these guys seem to be popping up a bit early even for early bloomers (man they're gonna have it rough in school...). I won't launch into any discussions on climate here ... but I will say even if they are abnormal, I was happy to see them. 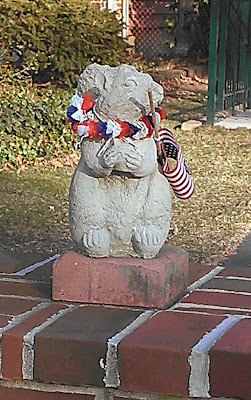 Of course, just as enjoyable to these signs of spring throughout the neighborhood are the signs of season's past. Of course, there are at least a few houses with lights still hanging from the gutters. And then there's the 'Parkly Deer. 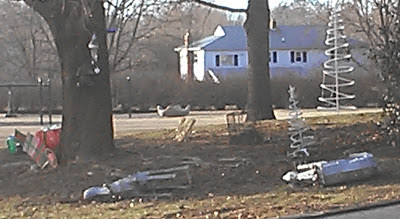 To recap, the 'Parkly Deer was put on display around Christmas 2011. Then he fell down. And he stayed down until Christmas 2012, when in a glorious show of hope in the season of light, he was righted and given a friend and surrounded by many other festive decorations. Then he fell down again. He's still down. And now, sadly, so is his friend. This is the part they didn't show in "Bambi." The grainy nature of this photo has to do with the fact that I was taking it at a distance, with my phone while holding the leash of my dog who was barking maniacally at the fence pug. Neighborhood surveillance is not for the faint of heart. You'll no doubt notice that they're both still surrounded by festive decor. I'll remind you that I took this photo yesterday. During the first week of Lent. Nearly a month from spring. Next to the house where there are crocuses blooming. See, I've been trying to figure out the deal behind these neighbors. 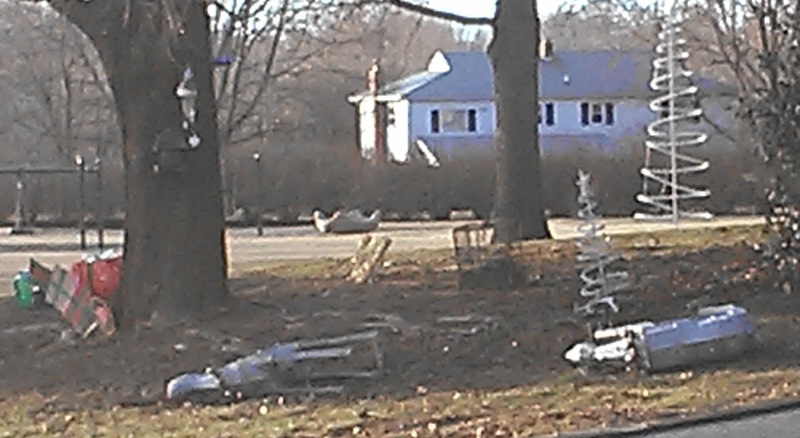 It doesn't bother me so much that they're Christmas decorations are still up mid-February. I'm assuming they'll be up until next Christmas. I can appreciate the level of procrastination or apathy that goes into ignoring the yard situation day after day after day (I mean, it's cold out! Who wants to deal with holiday decoration take-down when it's cold out). But the thing is, they're not ignoring their yard situation. This photo was also taken yesterday (Feb. 18). It's not just that they still have they're holiday decorations up, it's that they're still using them! What's more, their house is totally visible from the highway (which is where I was when I spotted it last night). This opens up a whole new 'parkly pandora's box. Who are these people? Or, more importantly, who can I invent them to be for noveling purposes? And that's what happens when I walk by your house too much. *I was only kind of kidding about this. I got an e-mail from my friend Becky with photos of her family's annual birthday party for Abraham Lincoln. The event was complete with red, white and blue birthday cake and homemade stovepipe hat party hats (including one for her 2-month-old nephew). So. That happened. **I'm not judging. The spawn of 2011's pumpkins are now sitting atop my mulch pile hopefully decomposing into this year's pumpkins.